I've read that when a body reaches about 13 times the mass of Jupiter that deuterium fusion starts and the body becomes a brown dwarf instead of a planet. I have a multiple question. Are there any other factors besides mass and possibly metal abundance (composition) that would determine this "turn on" point ? If the "brown dwarf" was detected indirectly and no spectroscopic information was available, could we assume that metalicity would be the same as the larger star ? *I did miss the related question when I posted this one, but I do have a question here that wasn't answered. It was about how stellar metallicity effects the onset of fusion. I think it may be as simple as whether or not adding "metals" makes the core hotter or colder for a given mass. I also wanted to know if I could assume that both "stars" in a binary system should have the same metallicity. *Now that I've read Rob's excellent (as usual) answer, I would be curious as to how long deuterium fusion lasts in brown dwarfs from 13 to 80 Jupiter masses and what happens (in models) when it stops. I don't have detailed model calculations to hand and I'm not sure they have been done for the small range of metallicity you mention. However, in handwaving terms. (1) Mass and composition are the most important variables. 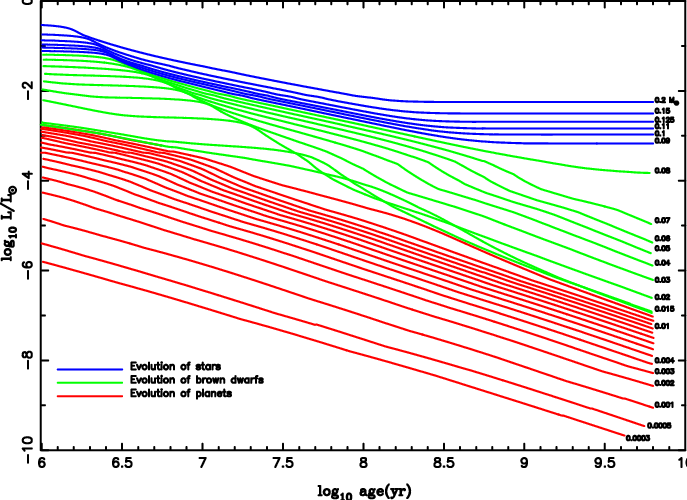 Helium abundance, in addition to metallicity, could play a role. Rotation could be a very second order effect. Very rapid rotation would lower core temperatures at the same mass. (2) This is the general assumption if a star plus brown dwarf companion formed in a binary or even if they formed in the same cluster. (3) Higher metallicity leads to larger opacity in the atmosphere and a larger brown dwarf. This is a small effect in fully convective objects like these, except perhaps when they are very young and have superadiabatic surface layer. However, as this is when D burning takes place, possibly there is a small effect - higher metallicity leads to a larger radius for the same mass and a lower core temperature. So the mass threshold would be slightly higher. (4) The duration of D burning is mass dependent. The graph below, from Burrows et al. (1997), shows luminosity vs time for brown dwarfs, planets and stars. The D burning phase is the early plateau in luminosity, lasting a few million years for things which are almost stars to maybe one or two hundred million years at 13 Jupiter masses. When D fusion ceases, then cooling recommences and the luminosity will continue to fade (forever), unless the object is massive enough to ignite hydrogen (i.e. a star: the difference between the green lines and blue lines on the plot). Not the answer you're looking for? Browse other questions tagged brown-dwarf nucleosynthesis or ask your own question. What does this figure imply about the luminosity of pre-main-sequence stars? Why does iron consume more energy in the fusion process than it produces? What is the largest possible size for a brown dwarf? How much star can star fusion fuse if star fusion can fuse hydrogen?